Sioux Falls’s One Size Fits All diesel oil. For any work engine requiring CI4 or earlier specification, this is the one fleets and accounts use for generators, skid steers, tractors (vintage too), golf courses use for all their equipment, and so on. Even your popular 7.3 Ford diesels, earlier 5,9 Cummins and any of the 80’s on up GM diesels. For ultimate economy yet longer intervals and superior detergency – this oil makes the grade. Basically the lower viscosity version of our best seller Diesel & Marine 15W-40. And just like the AME, this one is perfect for all and any gas engines too. Even loaded with ZDDP (zinc) for historically beneficial anti-wear properties. So for the Sioux Falls climate this diesel oil selection is perfect for a once per year oil change. Vehicles requiring CJ4 and up – select another AMSOIL diesel oil. 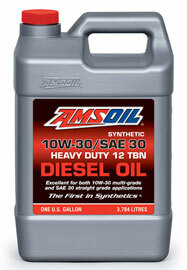 AMSOIL Synthetic 10W-30/SAE 30 Heavy Duty Diesel Oil (ACD) is formulated with premium synthetic base oils that exceed both 10W-30 multi-grade and SAE 30 straight-grade viscosity requirements for outstanding performance in modern and older diesel engines. Unlike conventional SAE 30 motor oils, AMSOIL ACD has a naturally high viscosity index and does not contain paraffin (wax). It has a -33°F pour point and qualifies for SAE 10W, making it an all-season multigrade lubricant with a wide operating temperature range. AMSOIL ACD is formulated without viscosity index (VI) improvers. This shear-stable formulation is designed to stop viscosity loss and associated bearing and cylinder bore wear. AMSOIL Synthetic 10W-30/SAE 30 Heavy Duty Diesel Oil contains premium additives with a high 12 TBN to neutralize acids from blow-by, exhaust gas recirculation (EGR) and high-sulfur diesel fuels. It protects against damaging piston deposits, ring sticking and sludge. AMSOIL, the leader in automotive synthetic lubrication, produced the world’s first API qualified synthetic motor oil back in 1972. Trust the extensive experience of AMSOIL The First in Synthetics® to do the best job protecting your equipment. Where these viscosity grades are specified, AMSOIL Synthetic 10W-30/SAE 30 Diesel Oil provides outstanding performance as a straight-grade SAE 30 for older two- and four-stroke diesels and as a multi-grade SAE 10W-30 in modern four-stroke diesel and gasoline engines. AMSOIL Synthetic Heavy Duty Diesel Oil is ideal for use in a wide variety of light and heavy-duty applications, including agriculture, off-road construction, trucking, mining, industrial (pumps and generators) and personal automotive or commercial transportation. It is recommended for use with low- or high-sulfur diesel fuels in standard, turbocharged or supercharged engines, all off-road engines and pre-2007 on-road engines. AMSOIL ACD is compatible with conventional and synthetic motor oils, however, mixing AMSOIL ACD with other oils will shorten the oil life expectancy and reduce the performance benefits. AMSOIL does not support extended drain intervals where AMSOIL ACD has been mixed with another product. Aftermarket additives are not recommended for use with AMSOIL ACD. AMSOIL Synthetic 10W-30/SAE 30 Heavy Duty Diesel Oil (ACD) is recommended for extended drain intervals in engines that are unmodified and in good operating condition. Keep Out of Reach of Children. Don’t pollute. Return used oil to collection centers. For warranty information, visit AMSOIL Warranty Information.